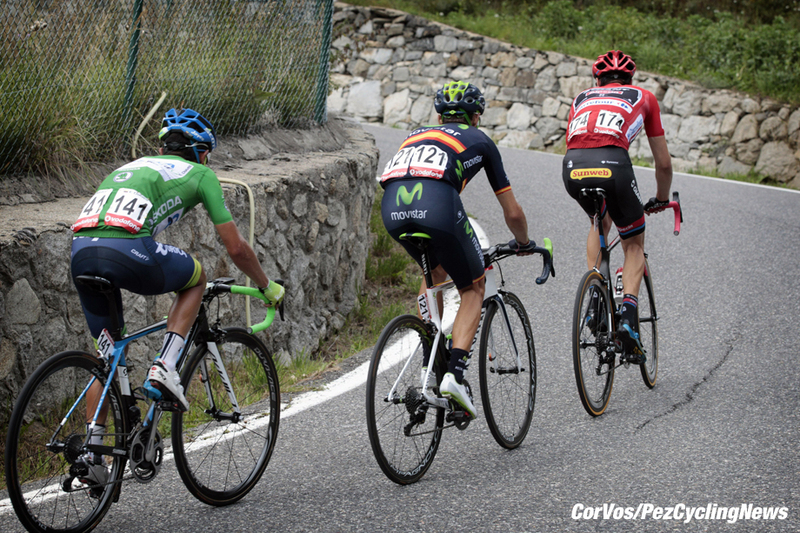 PezCycling News - What's Cool In Road Cycling : Vuelta’15 St.11: Landa Lands It In Andorra! 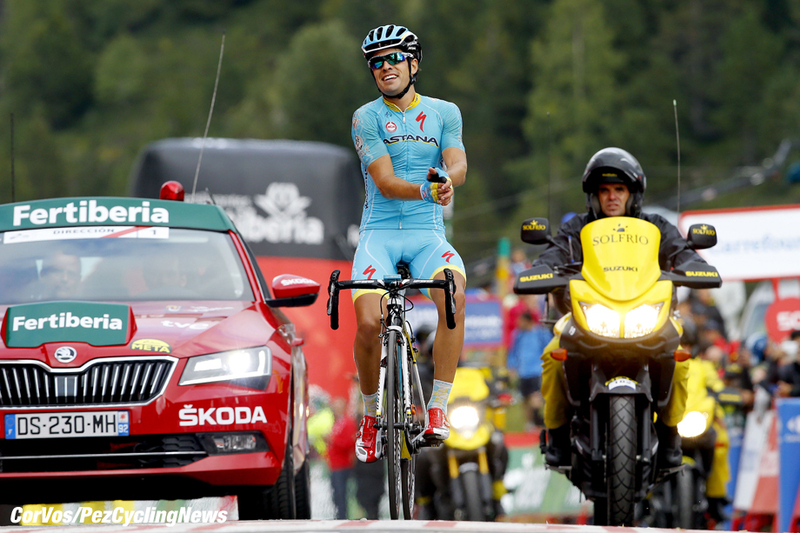 Vuelta’15 St.11: Landa Lands It In Andorra! Race Report: On a horrendously hard stage, straight after the rest day, it was a Spaniard who took the win but the big news was that his team leader had made the move of the race and would take the overall. Mikel Landa finished a brutal stage with a well-earned victory; Fabio Aru wrestled the Red Jersey from the never-say-die Dumoulin while Chris Froome suffered horribly having crashed before the day started. Another moto incident saw Sergio Paulinho (Tinkoff-Saxo) taken out of the race and now team owner Oleg Tinkoff is threatening to pull his team out of the event... surely the UCI will have to step in now. The rest day was a time for riders to take stock, lick wounds and get ready to come out fighting. Straight into not just the hardest stage of this tour but the hardest stage of any Grand Tour of recent years. 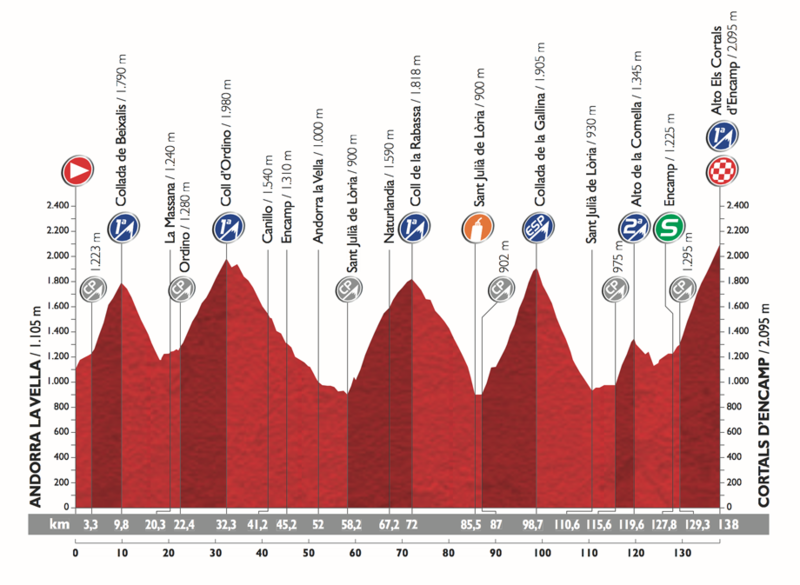 One 2nd Category mountain, four 1st Cats and one ‘Especial’ climb to sort out the main players from the early pretenders. And it couldn’t have started in worse fashion for this year’s Tour de France winner Chris Froome (Team Sky). A crash in the neutralized section left him chasing a bunch that was not waiting and was in fact splitting all over the road as they climbed away from Andorra La Vella up the 1st Cat ascent of Collada de Beixalís. Romain Sicard (Europcar) and Darwin Atapuma (BMC) had pushed clear at the front while other riders went out the back. Omar Fraile (Caja Rural – Seguros RGA) took Jérôme Coppel (IAM Cycling) and Nelson Oliveira (Lampre-Merida) with him as he attempted to get across and protect his KOM jersey. Fraile made the junction and took the points over the summit with more riders chasing. Onto the second climb of the day, the Coll d’Ordino at 1980m and a group of 19 had formed at the front, many placed there to come into play later in the stage. Froome was by this time back in the main bunch and attempting to breathe a little easier having lost his natural reserve as he chased on with his teammates. With the break now apparently established, the pressure seemed to have eased up. Over the top of the Ordino and Fraile was again trying for points but had to settle for 2nd spot to Ruben Plaza (Lampre-Merida). On the long run down from the summit Movistar’s Imanol Erviti took off on his own, perhaps sensing a lack of the work ethic in such a big group. Behind, Team Sky was at the head of the peloton, or what was left of it as riders were being shelled out the back, and were keeping the gap to a manageable 4:30. Erviti was on his own by 1 minute as the group behind began to break up. Some of the riders had shown themselves to be less than great descenders and the others were looking for some wiggle space on the 13km descent. Erviti was over the top as the race pace was quite high on this Joaquim Rodríguez (Katusha)-designed stage. With the split behind, Erviti’s lead had dropped to 20 seconds as overhead the dark clouds began to threaten. Erviti took maximum points over the top but Fraile was active behind and again took 2nd position to add to his tally. On the descent the break came together and we had 19 in the lead once again. Tom Dumoulin (Giant-Alpecin) was still with the main bunch which was holding at 4:30 and he must have been dreaming of getting to the finish, still in red. Valverde had reported during the rest day that his shoulder was giving him trouble and the Spanish media had also said that Quintana had been sick for a couple of days. The team, though, said he was now well and fighting fit. On the ascent of the Especiál Categorie climb, the Collada de la Gallina, three riders went clear and were soon joined by two more. We had Jérôme Coppel, Ian Boswell (Team Sky), Pawel Poljanski (Tinkoff-Saxo), Romain Sicard, Atapuma and Mikel Landa (Astana) while behind, the peloton, which was now down to 70 riders, was at 5 minutes. Chris Froome fought on to finish the stage, but will he start tomorrow? Sky had stopped driving and it soon became clear why... Chris Froome was hanging off the back of the bunch with Geraint Thomas keeping him company and trying to pace him back. Was it a result of the crash, the often ‘bad day’ after the rest or just general fatigue after a long, tough year. Astana had taken up the pace, watched by Movistar, and Froome was now 40 seconds down, and going backwards. Landa had gone off the front, stage hunting or waiting for an attack by Aru? We’d have to wait and see! Froome was now 2:30 behind the Astana-led group which had been reduced to 20 riders while up ahead that man Fraile had made contact with the lead group just before the summit and once again took maximum points. Froome was at the medical car but they couldn’t help and then the team car came up... all the signs were pointing to an abandonment but Froome continued to ride, even taking his feed musette. With Astana pushing the group on the descent, and Froome now 3:30 behind them, Valverde (Movistar) and Rodríguez (Katusha) put their plans into operation. Both had the same idea and went off the front while up ahead their teammates were dropping back in support. Valverde had Erviti and Purito had Dani Moreno and Alberto Losada and together they had 30 seconds over the group which still contained Tom Dumoulin. And now it began to tell on Dumoulin as Chaves (Orica-GreenEDGE), Quintana, Aru and Dario Cataldo (Astana) clipped away from the Red Jersey wearer and made the junction with the Valverde/Rodríguez group. With the lead riders now only ahead by 2:32 it was looking like the race winner would come from this selection. It was always thought that the fireworks would come on the short, steep 4km Cat 2 climb of the Alto de la Comella and this was proving to be the case. There had been a lot of talk on the descent about crazy maneuvers of the moto pilots and news came through that Tinkoff-Saxo’s Sergio Paulinho had been hit by a TV bike. Oleg was not slow to vent his disgust via Twitter and surely the race organizers will have to do something now. Dumoulin had no teammates around him but thanks to a big push from Domenico Pozzovivo (AG2R-La Mondiale) he was able to rejoin the Valverde/Rodríguez group. It’s well known that these two riders are not the best of friends and neither was prepared to sacrifice their team helpers for the other. However, the leaders were tiring and now only had a 2-minute lead while behind, Froome was at 7:09 but battling on, blood showing through his jersey. Paulinho had tried to ride on but he needed 17 stitches to close a gaping wound and so it was out of the race and off to hospital for him. The leaders were onto the last climb, Landa having come over the summit of the Comella first and now Fraile was being distanced. They were aware that with a gradient of 9.1% and the favorites coming up fast, it would prove difficult to stay away. 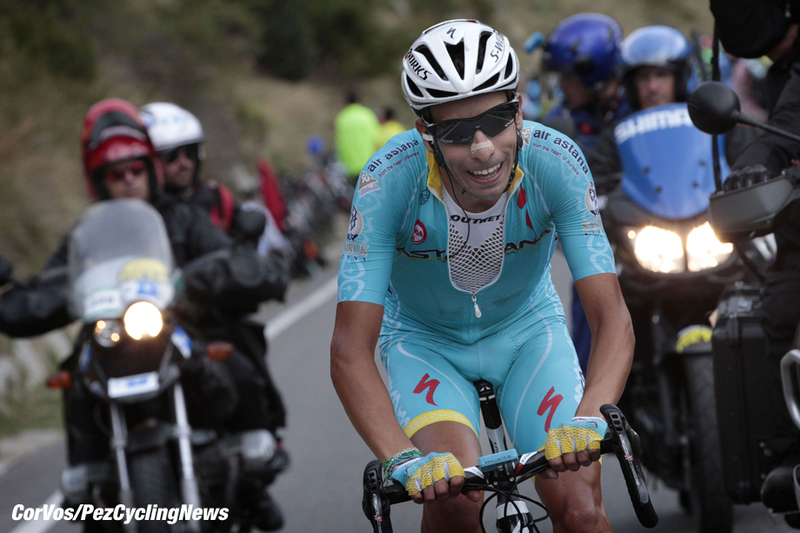 With Aru in the group behind, Landa knew his time was now and took off up the road, and up the mountain. Landa might have wanted the win but Aru attacked his group... just a trial attack to see who was paying attention. And it was the stage-designer Rodríguez who went after him with Moreno leaving Valverde struggling behind with Quintana and Majka (Tinkoff-Saxo); Dumoulin and Chaves couldn’t hold the wheels. Chaves put the effort in and brought race-leader Dumoulin back to the Valverde group but the trio ahead was moving away. 6km to run and Landa still had 2-minutes over this group of favorites containing his team leader. Mikel Nieve (Team Sky) and Majka dropped the Valverde group in an attempt to ride across the gap just as Aru punched again and moved ahead of the two Katusha riders. Landa was going for the win, but Aru was going for the overall and nobody could go with him. He needed 1:13 on Dumoulin but the big Dutchman was turning himself inside out, even seeing Valverde dropping away from his group containing Chaves and Luis Leon Sanchez (Astana) with Quintana a little ahead. Aru was passing rider after rider from the original break and now had 1-minute on Dumoulin with 3.5km to go. Rodríguez was in the middle with Moreno but had run out of energy and couldn’t close on the young Italian. Landa was into the final kilometer with a 1:32 lead and would surely take the win but the question was how much time would the virtual race-leader Aru take from Dumoulin? Mikel Landa proved to be the bravest rider of the day on the hardest stage ever and took a well-deserved win in his home Tour but all eyes were on his team leader as he moved into the race lead. Mikel Landa, the big win! The time gaps would play out but the day belonged to Astana and who would now bet against the man that missed the Tour de France in order to be in top condition for this Vuelta? 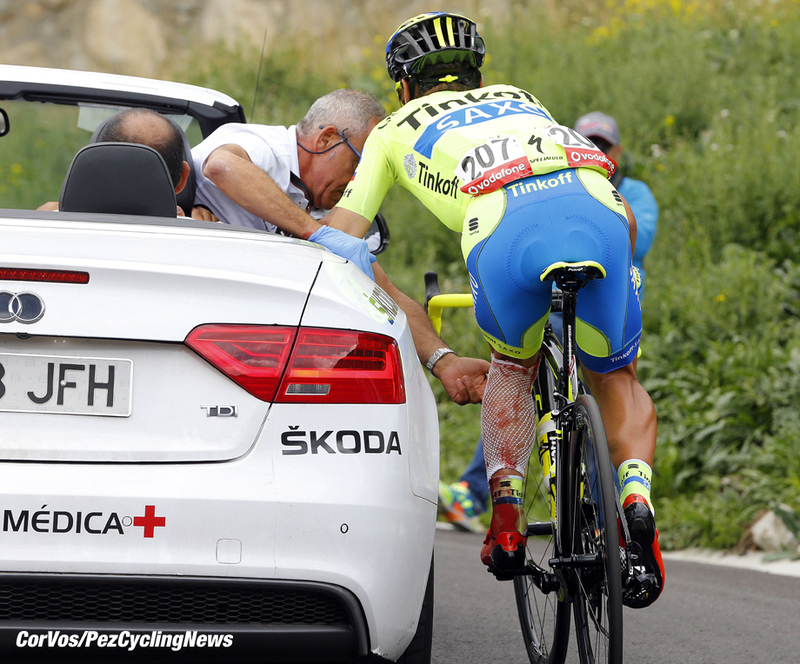 It may not be a Tinkoff-Saxo rider as Oleg Tinkoff tweeted: "I'm considering now to take the team off the #Vuelta2015. Boycott #ASO for this. They pay us NO money for the race and even damage riders." 25. Kenny Elissonde (Fra) FDJ.fr. 25. Frank Schleck (Lux) Trek at 22:07.